There is a car park off Cherry Orchard Way which gives access on to the park and directly to the children's play area. Footpaths lead into the park from the old bridleway that runs roughly parallel to Green Lane and Western Approaches, Eastwood. The park can be accessed from the northern boundary of Edwards Hall Park, where there is also a car park. A footpath leads into the park from Eastwood Rise, Rayleigh and from Gusted Hall, Hawkwell, the by-way through the Scrubs runs down to the park. Plans have been submitted for another car park at the western end of the park by Grove Woods. The map below is useful as it includes postcodes at strategic points in the park. 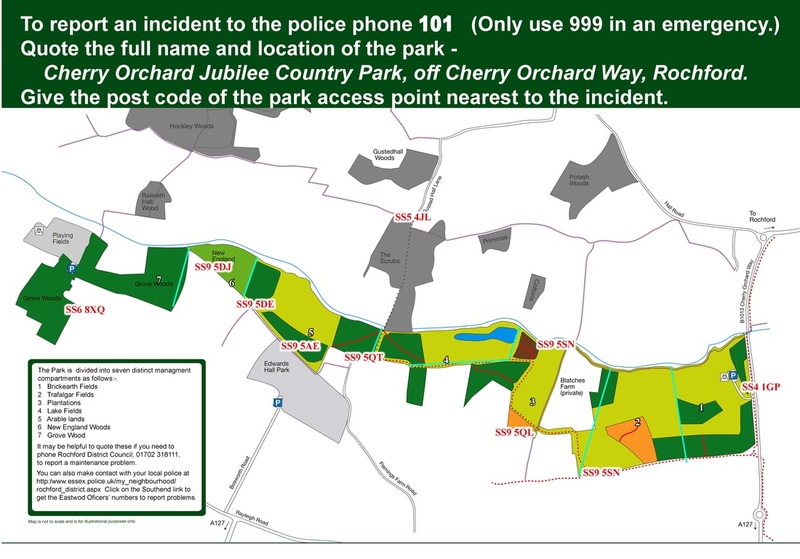 Very useful if you are reporting an incident or problem in the park.